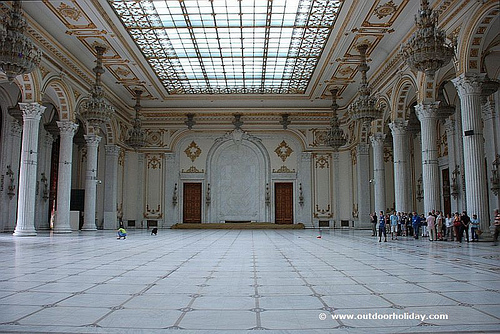 In all the bloody revolutions of history, no civilian building has played such a large role as the Palace of the Parliament in Bucharest, Romania. The story begins in 1981 with the Romanian communist party leader Nicolae Ceaușescu, a certifiably crazy tyrant. Ceaușescu enacted harsh austerity measures to liquidate the country’s foreign debt of about $10 billion. Every day necessities such as food, fuel, and clothing were rationed to such a degree that malnutrition ran rampant and Romania claimed the highest infant mortality rate in Europe. 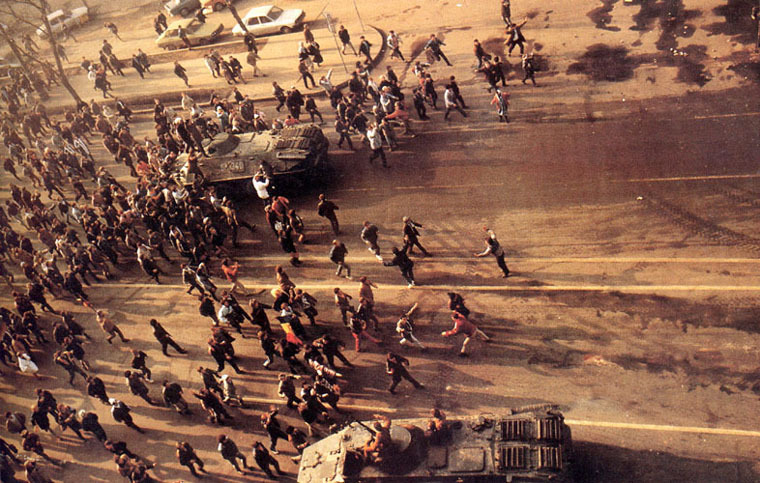 To help enforce his law, Ceaușescu operated a brutal secret police force — the Securitate. 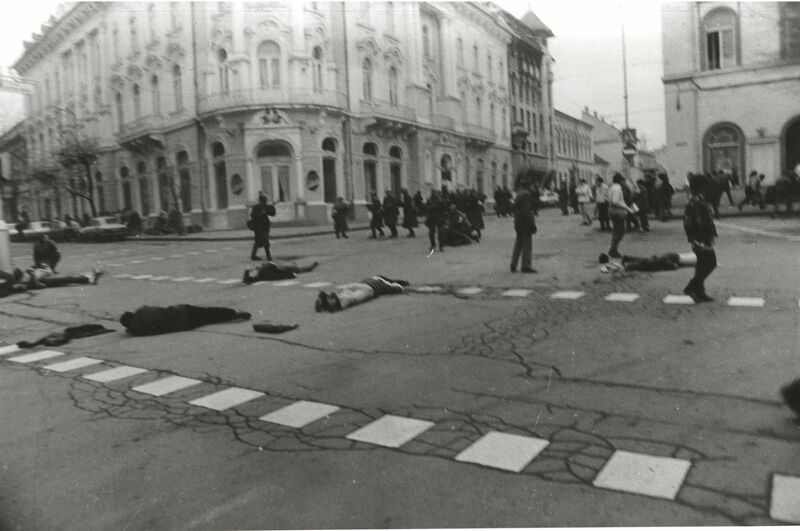 Even among other Soviet bloc countries, the Securitate’s brutality stood out as they kidnapped or killed thousands of Romanians. Under Ceaușescu, the Securitate employed some 11,000 agents and a half-million informants for a country with a population of only 22 million–that’s about 1 informant for every 43 citizens. Dissent against the communist party was strictly forbidden. Like many infamous dictators, Ceaușescu nurtured a cult of personality with weekly shows in stadiums or on streets in different cities dedicated to him, his wife and the Communist Party. Despite paying off the country’s debt in 1987, he continued his austerity program unchanged so he could order the construction of a multitude of buildings designed to bolster his reputation such as the Centrul Civic (Civic Center) and the Dâmbovița Center, a museum dedicated to communism and Ceaușescu himself. 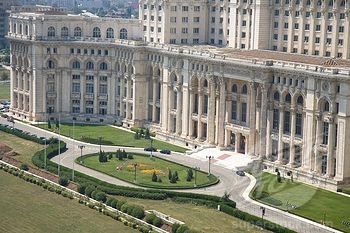 The Palace of the Parliament, however, is by far the most notable project and it is IMMENSE. The Palace of the Parliament is the world’s third largest building by volume after the Aztec pyramid of Teotihuacan and the Cape Canaveral rocket assembly hangar. It is the second largest administrative building behind the Pentagon and it is the largest palace in the world. It contains 3,500 tons of crystal, one million cubic meters of marble, and the carpet in the main Union Hall alone weighs 1.5 tons. Construction involved 700 architects, 20,000 building workers operating three shifts a day, 5,000 army personnel, 1.5 million factory workers, and an army of “volunteers.” The site’s construction required the tearing down of 9,300 homes, one cathedral, and more than a dozen churches, most dating from the 19th century or before. 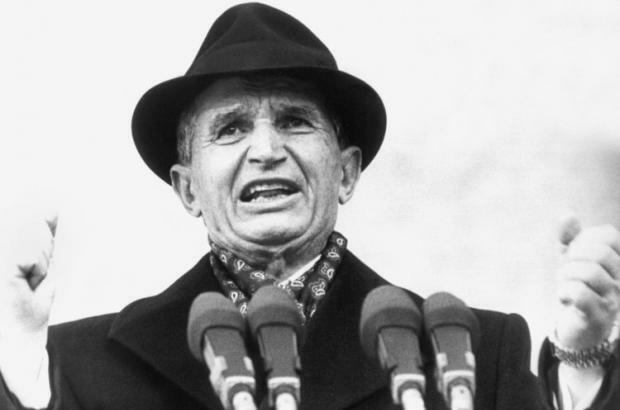 Ceaușescu withheld life’s necessities–food, clothing, gas–so he could use the “savings” to construct a monstrous monument to himself that would end up as the world’s most expensive administrative building. Unsurprisingly, Romanians were not happy about this lavish construction taking place while their infants were dying and they could hardly feed themselves or stay warm in the winter. After years of oppression and tyranny, the Palace of the Parliament may have been the straw that broke the camel’s back. In July, 1989, pastor László Tőkés spoke out against the Romanian government on Hungarian television. The Romanian government responded by forcing him to hide in his house in the countryside. On December 16, his parishioners and other passers-by spontaneously gathered around his house to protect him from harassment and eviction. The crowd grew over time and eventually exploded into a full on riot. Ceaușescu, who genuinely thought his people loved him, had seen no use for training riot police so the only way to control the riot was with military troops. The securitate used tear gas and water jets, the police beat rioters, and once the military arrived, they fired wildly into the mob, ran protesters over with armored vehicles, and patrolled the streets in tanks. 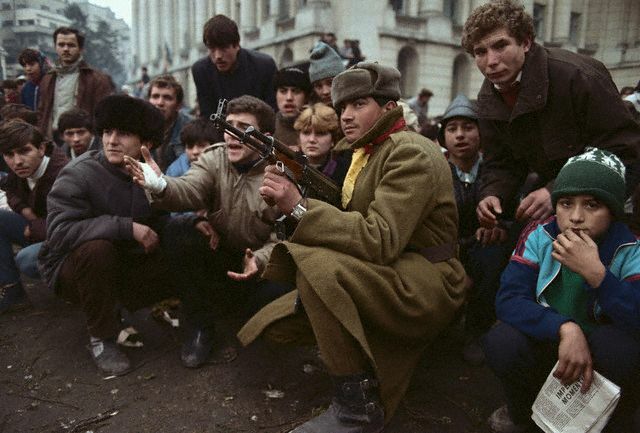 As time passed, and after a failed speech by Ceaușescu, even the military eventually joined the revolutionaries. After rioters overran his security, the defeated dictator fled in a helicopter and was later arrested, tried in a kangaroo court for genocide and other crimes, and executed along with his wife. By the end of the revolution, 1104 Romanians were dead, and 3352 were injured. Ceaușescu’s overthrow was inevitable but I imagine that he could have retained power a little bit longer if he hadn’t so heinously insulted his countrymen with his opulent spending. After the revolution, Romanians debated the palace’s future. Some, caught up in the excitement of revolution, argued that the garish symbol of communism should be dynamited. Others argued for a museum of communism. A large portion of Romanians realized its enormous cultural value as a record of Romanian heritage. Consequently, it was decided that the construction should house the Chamber of Deputies and the Senate of Romania. Today, the numerous conference halls and salons serve a wide variety of miscellaneous purposes. In 2003-3004, a glass annex was built to accommodate the National Museum of Contemporary Art (MNAC) and the Museum and Park of Totalitarianism and Socialist Realism. Daily tours are available in multiple languages but even with these new uses, the palace stands 70% empty and it costs $6 million a year in maintenance. Many still question the role the mountain of marble should play in Romania’s future. Nonetheless, the Palace of Parliament, a reminder of tragedy and oppression too large to ignore, will continue to mark the horizon of Bucharest for many years to come.